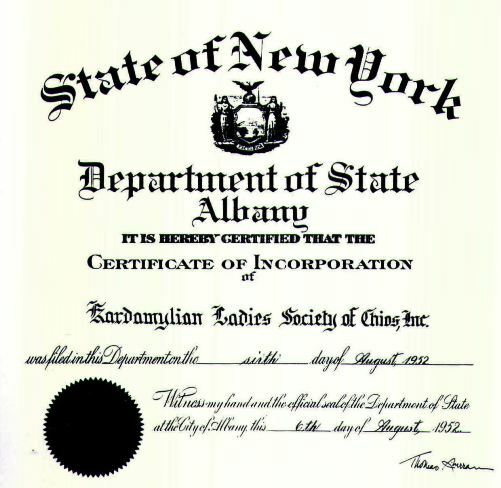 KARDAMYLIAN LADIES SOCIETY OF CHIOS, INC.
During the first years of the Kardamylian League's existence, women were not listed as members even though there were no rules to prohibit them from becoming members. Instead, the Kardamylian women in 1945 established their own organization under the name of KARDAMYLIAN LADIES SOCIETY OF CHIOS, INC. Their purpose was friendship and to help each other. In 1952, the women's Society received its own charter as a not for profit organization from New York State. The Kardamylian League and the Kardamylian Ladies Society worked for years together as brothers and sisters in organizing events and helping their fellow members. It is also well known that occasionally there were disagreements among them. . The following women and certainly many others are listed as the founders of this organization: Maria I. Tsevdos, Calliope G. Vafias, Filia F. Parlamas, Evangelia K. Kefalas, Anna E. Katsounis, Kalliope Kolonas, Victoria Libanos, Stella Vios, Maria Kaloudis, Maria Tsangaris, Maria Poutous, Athena Kalogeras.